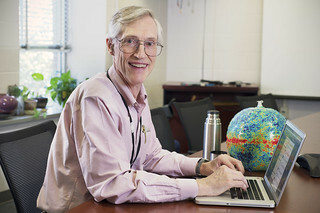 These are the answers Dr. John Mather (Nobel Laureate and James Webb Space Telescope project scientist) gave to questions asked on Twitter during our second Tweet Chat. The answers are very succint due to Twitter's 140 character limit (and we also added the #JWSTscience hashtag to each answer). Often the questions are rephrased in the answers so that our Twitter followers would know what we were giving the answer to. A: We're eager to see how life might possibly exist on Mars. #JWST will look for exoplanet oceans. A: It is a very ambitious project and it takes a long time to put it together and test it. A: Yes, are specially set up to see the spectral signature of clusters of metal-free Pop III stars with NIRSpec. A: No, origami wasn't an influence, but we did make a list of 50 possible ways to fold the telescope. A: What big questions are we hoping to answer with #JWSTscience? How did we get here? Are we alone? A: Most galaxies have a black hole in the center; we don't know how they got there. We hope to learn more with #JWSTscience. A: #JWST will see things we've never seen before because it is so much more powerful than anything else. A: #JWST will take 2 months to cool down & 4 months to set up post-launch, before taking scientific data. Q: Will you be able to observe GRB low energy afterglows in the infrared? A: Yes, we can observe GRB low energy afterglows in infrared. #JWST is powerful for studying the early universe. A: Yes. #JWST will measure the time dependence of the dark energy to see if it matches the cosmological constant. A: Larger telescopes give sharper images. We won't look at Earth but others can use similar tech to get better imagery. A: There is always the chance to detect intelligent life with #JWSTscience, but it would be a extremely huge surprise. A: #JWST will find many new asteroids, Kuiper Belt Objects, and dwarf planets in our solar system. A: Yes, #JWST can look at objects in the solar system from Mars outwards. A: Young students are curious about everything! Hands on discovery of things around us is the beginning of science. A: We have wonderful ideas for a century of great telescopes, but the next big space telescope hasn't been chosen. A: You can explore what #JWST will see using this exposure time calculator: http://jwstetc.stsci.edu/etc/ #JWST can see the heat signature of a bumblebee at the distance of the Moon. A: First images will be available ~6 months post-launch when telescope set-up is complete. Promise they'll be beautiful! A: #JWST will carry coronographs to enable photography of exoplanets near bright stars, but they will be only "dots." A: Oort Cloud objects are far too faint, even for #JWST, unless we get extremely lucky. A: Hurricanes and galaxies are both organized by a pull towards the center. A: Yes, #JWST will try to get spectral characteristics and colors of exoplanet light.